1 Main Street Apt 9A, Brooklyn, NY 11201 | Sotheby's International Realty, Inc.
$3,699,000 3 Bedrooms*2 Full / 1 Partial Baths2,198 sq. 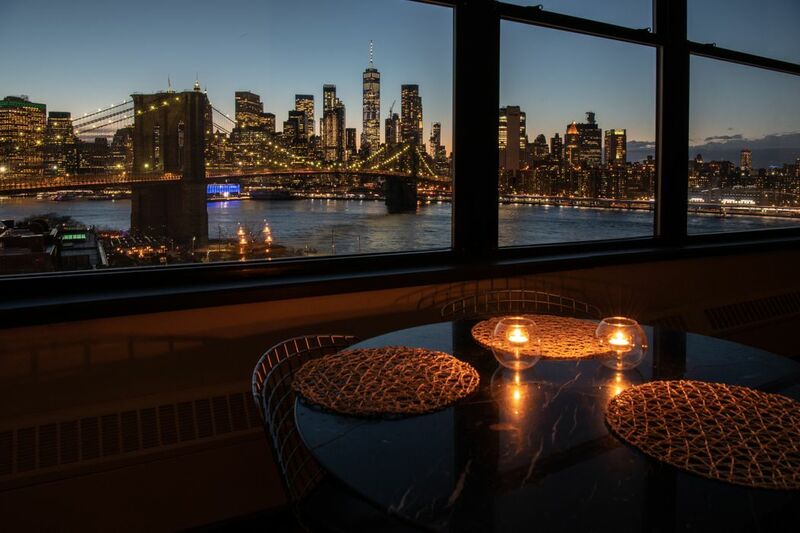 ft.
Picture-perfect views of the Brooklyn Bridge, East River, Jane’s Carousel, Brooklyn Bridge Park, and the Downtown Manhattan skyline are visible from every window in this sprawling, approx. 2,198 sq. ft. loft. Located in the coveted Clocktower condominium, this beautiful 2-bedroom plus home office boasts 2.5 baths, 11’ +/- concrete beamed ceilings, hardwood flooring throughout, an open kitchen/dining space, and a sun-filled living area with large windows and breathtaking views. The gourmet Chef’s Kitchen includes brand new kitchen cabinets, a breakfast bar, Sub-Zero refrigerator, Viking cook-top, Thermador oven, and Bosch dishwasher. The master suite includes a spacious walk-in closet, large windows with radiant views flooding the space in natural light, and an en suite master bath with a whirlpool tub and separate shower. The second spacious bedroom also includes an en suite bath, large windows with stunning views, and a walk-in closet. The oversized home office is currently configured as an interior sleeping area. This sprawling home includes central air conditioning and a large separate laundry room with an in-unit washer/dryer and plenty of room for storage. The Clocktower condominium, DUMBO’s premiere loft building, boasts a magnificent marble lobby with 24-hour concierge service, a bright, well-equipped gym, and adjoining common roof deck, bike room, and storage center. 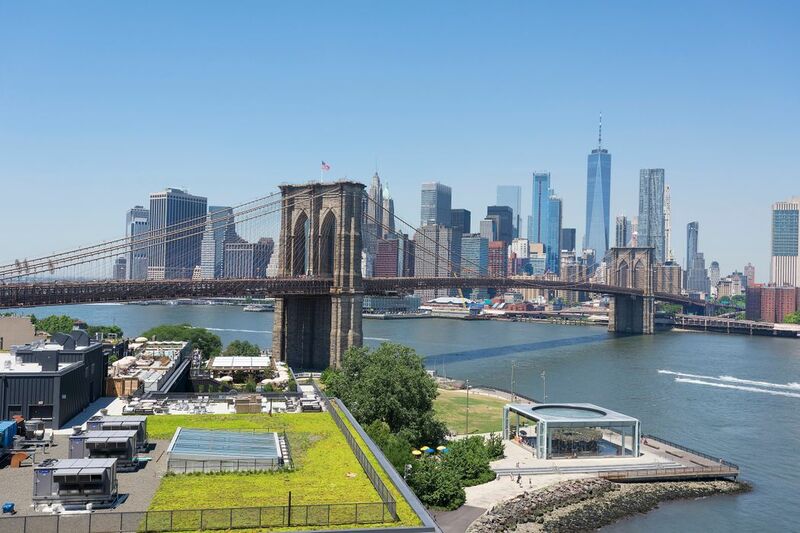 The Clocktower is located in close proximity to Brooklyn Bridge Park, Empire Stores, Jane’s Carousel, St. Ann's Theater, restaurants, shopping, subways, ferry, and all that DUMBO has to offer. 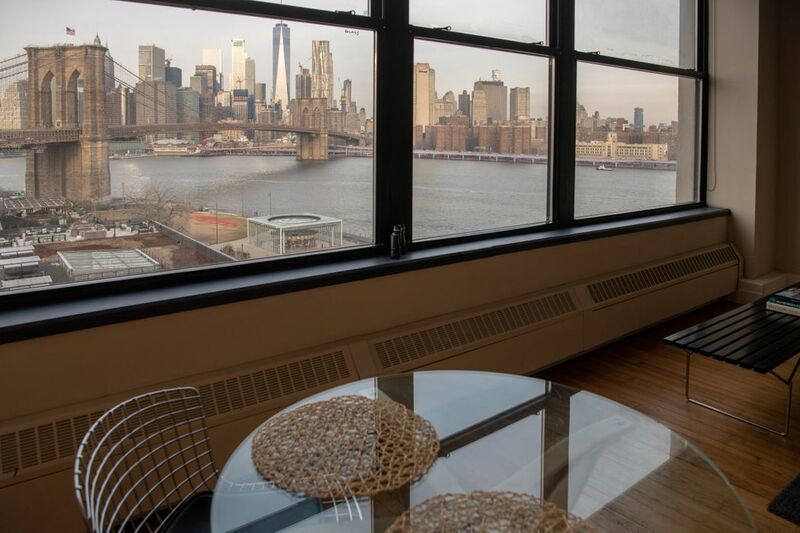 Picture-perfect views of the Brooklyn Bridge, East River, Jane’s Carousel, Brooklyn Bridge Park, and the Downtown Manhattan skyline are visible from every window in this sprawling, approx. 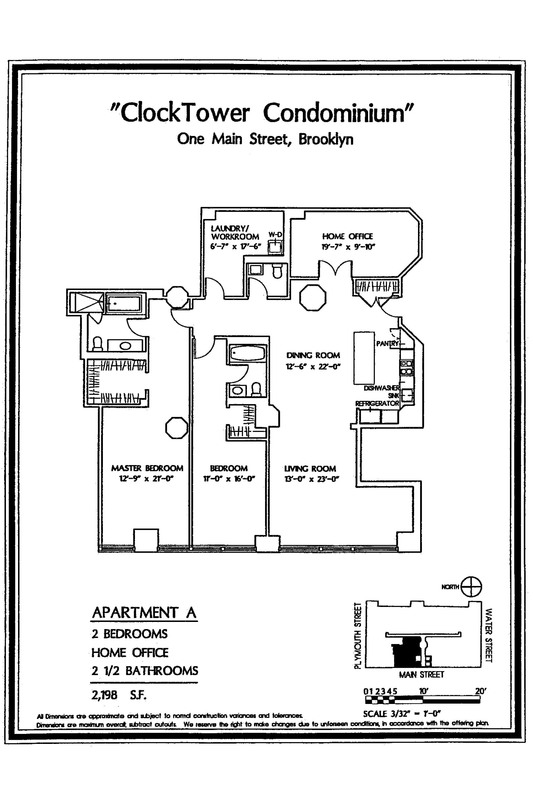 2,198 sq. ft. loft. Located in the coveted Clocktower condominium, this beautiful 2-bedroom plus home office boasts 2.5 baths, 11’ +/- concrete beamed ceilings, hardwood flooring throughout, an open kitchen/dining space, and a sun-filled living area with large windows and breathtaking views. 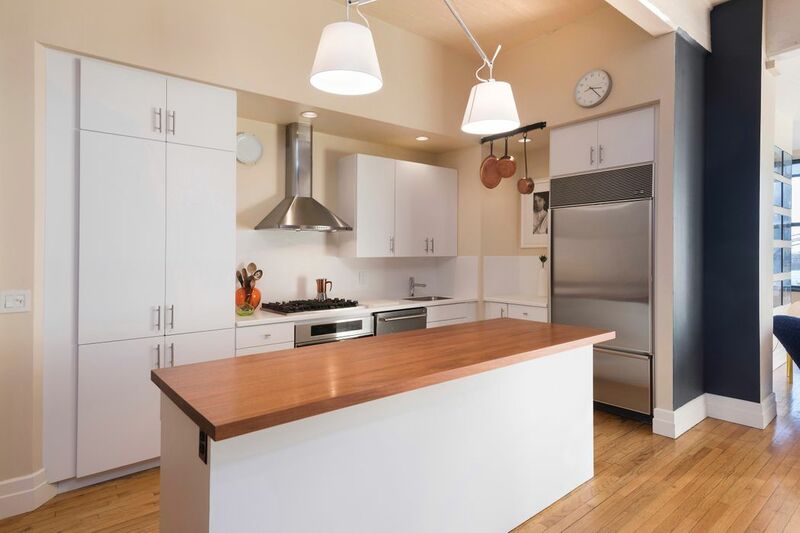 The gourmet Chef’s Kitchen includes brand new kitchen cabinets, a breakfast bar, Sub-Zero refrigerator, Viking cook-top, Thermador oven, and Bosch dishwasher. The master suite includes a spacious walk-in closet, large windows with radiant views flooding the space in natural light, and an en suite master bath with a whirlpool tub and separate shower. The second spacious bedroom also includes an en suite bath, large windows with stunning views, and a walk-in closet. The oversized home office is currently configured as an interior sleeping area. This sprawling home includes central air conditioning and a large separate laundry room with an in-unit washer/dryer and plenty of room for storage. The Clocktower condominium, DUMBO’s premiere loft building, boasts a magnificent marble lobby with 24-hour concierge service, a bright, well-equipped gym, and adjoining common roof deck, bike room, and storage center. 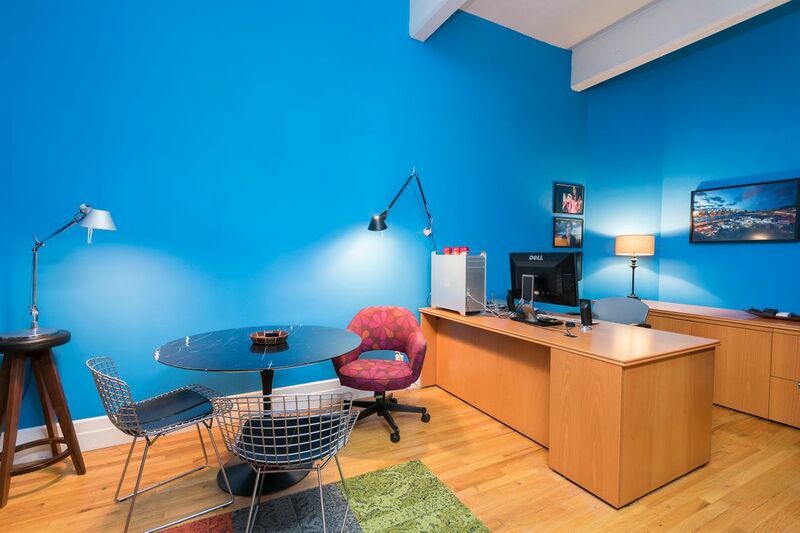 The Clocktower is located in close proximity to Brooklyn Bridge Park, Empire Stores, Jane’s Carousel, St. Ann's Theater, restaurants, shopping, subways, ferry, and all that DUMBO has to offer.